Featuring the new Dry Lock (DL) port system. Vacuum valve included. TTL circuitry sold separately. Lens port and zoom gear sold separately. The single most important upgrade is Ikelite long awaited new Dry Lock (DL) port system. This exciting new system is even more robust and even easier to assembly than Ikelite time-tested Four Lock (FL) system. The new ports are lighter and more adaptable, and can accommodate extremely large diameter lenses with ease. If you're considering shooting professional quality lenses like the Canon EF 16-35mm Type II/III or the Canon EF 11-24mm, then the DL system is essential. Due to differences in mount diameter and zoom engagement, DL and FL system ports cannot be used interchangeably. The DL port mount may be removed and replaced with old style port locks for legacy users with standard or modular ports from Ikelite Four Lock system. This modification will prevent the use of newer DL ports. The housing cannot be converted back and forth repeatedly. Re-installation of the DL port base will require the housing to be returned to Ikelite or an Authorized Dealer and may incur additional service charges. 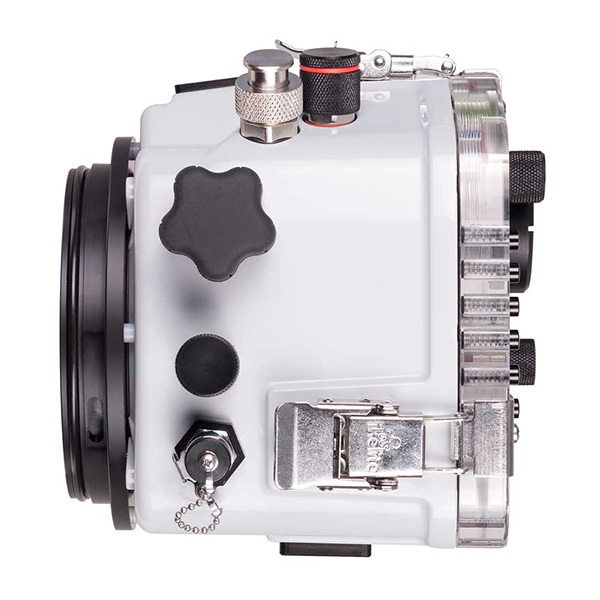 This housings supports your choice of shooting all manual or adding TTL electronics depending on your application. 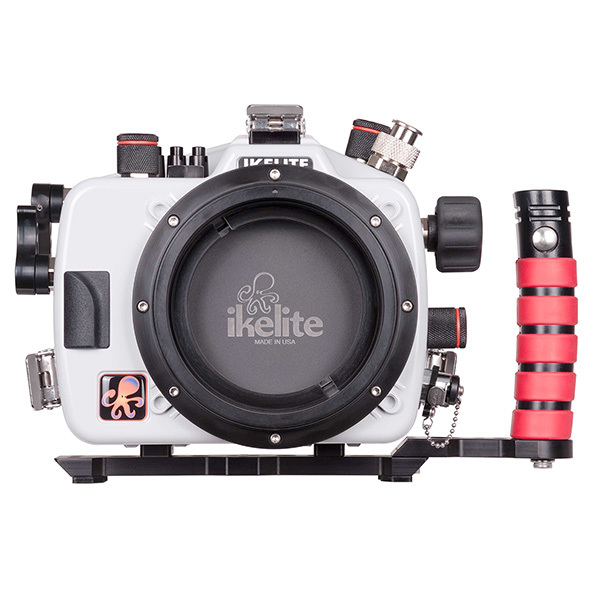 Ikelite new modular electronics system allows the housing to be updated with future strobe communications products as they become available. The flash bulkhead has been moved to the top of the case for improved cord routing and reduced strain. 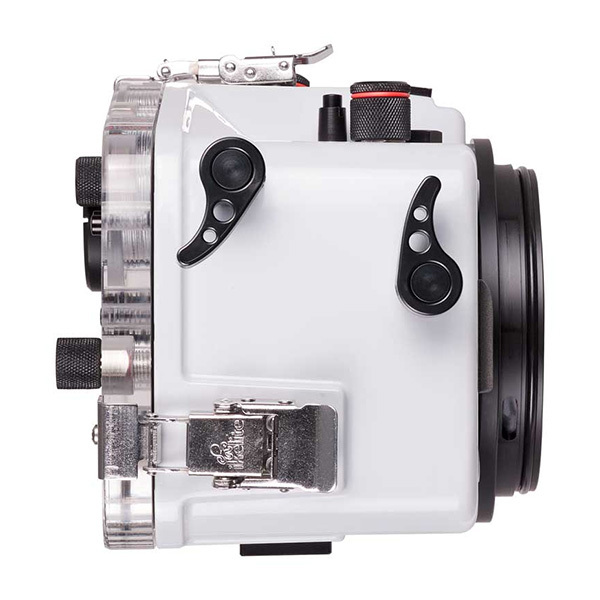 Reliable locking connectors between the hotshoe and bulkhead make it easy to install the optional TTL electronics or carry back up parts when traveling to remote locations. Even Ikelite push buttons have been redesigned to reduce weight and salt build-up. The back of the housing features laser engraved control symbols which will never fade or fall off. 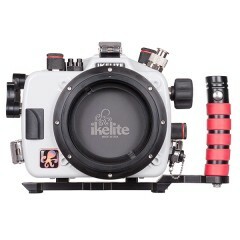 Ikelite new hard anodized aluminum base with quick release handle has also been streamlined for travel and is over 3/4 pound lighter than Ikelite previous DSLR tray and handle system. The Right-Hand Quick Release Handle # 4077.02 (sold separately) can be added or removed depending on how you want to shoot. The precision machined aluminum base features 1/4-20 tripod mounting sockets and additional mounting locations for future accessories. Plus, the base and handle can be quickly removed when breaking down your system for travel. 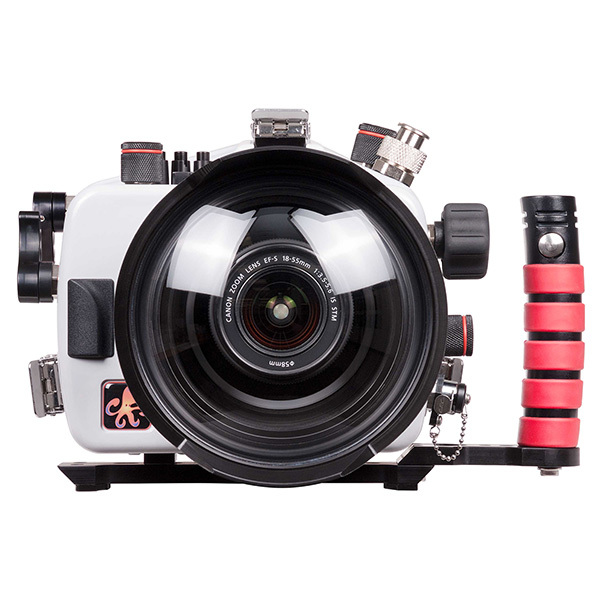 Ikelite new white ABS-PC blend front is stronger than its clear counterpart, provides improved contrast and visibility, and keeps your camera running cooler in the sun. 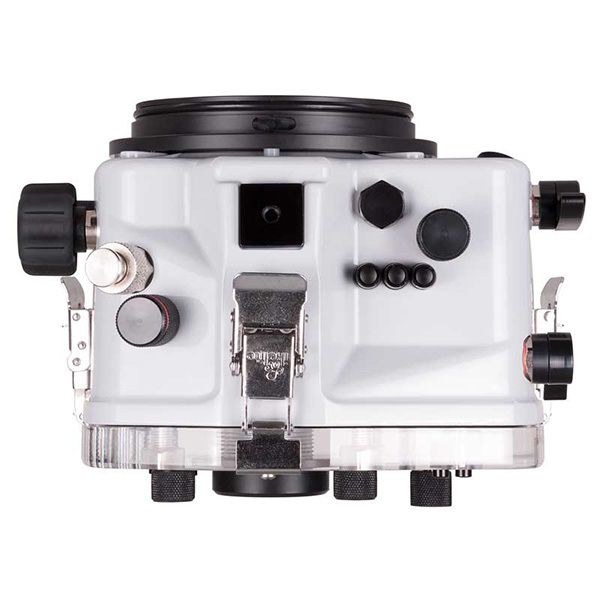 Like its predecessor and all of Ikelite housings, this product is made in the USA, individually inspected for fit, and water pressure tested to 200 feet (60m). Controls All important camera functions. 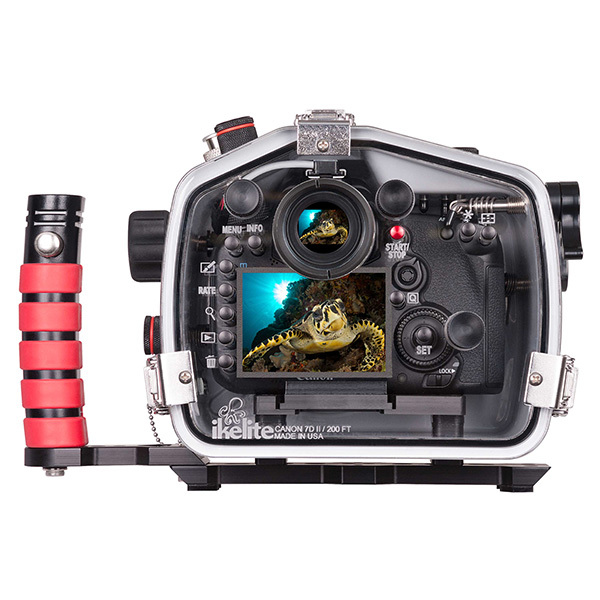 Strobes Included Ikelite ICS-5 bulkhead connector with manual hotshoe for reliable electrical triggering of underwater strobes.